The St. Lawrence River taken from the excavations of the St.Louis Forts by the Chateau Frontenac. What a cool photo! A window to the world! That's such a terrific shot! What a beautiful place. Any place near or on the water is magical. Beautiful perspective and subject matter! Nice angle for that beautiful photo! Ahhhh if walls or bricks could talk and they could tell us of their history... what a story that would be... great picture & thanks for sharing! That's a fabulous photo; perfectly framed! 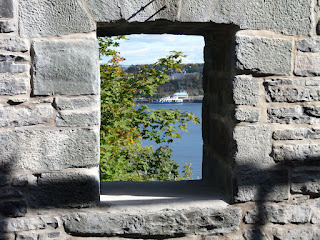 I love to visit old forts - they are so interesting! Love this shot.